Our combined knowledge and expertise will enable AIG to achieve its goals over time. Our founder and principals are leading figures from business, government and academic life. Together, we share a strong vision for the future of African governance and the potential of our continent and its people. Although our goals are ambitious, we believe that with the knowledge and expertise of our Board of Directors and our Advisors, we will ultimately achieve our objectives. Aigboje Aig-Imoukhuede is the Founder and Chairman of the Africa Initiative for Governance. He is a lawyer, banker, entrepreneur, and philanthropist. Mr Aig-Imoukhuede holds a law degree from the University of Benin and was called to the Bar in Nigeria. He also holds a Trium MBA, awarded jointly by the London School of Economics, New York University, and HEC Paris. He is a Fellow of the Chartered Institute of Bankers of Nigeria and a Fellow of the African Leadership Initiative. He is the Founder and Chairman of Coronation Capital, prior to which he was Group Managing Director and Chief Executive Officer of Access Bank Plc, where he led the transformation of the bank to rank amongst Africa's leading banks. In 2012, Mr Aig-Imoukhuede was appointed Chair of the Presidential Committee on the Verification of Fuel Subsidies. His oversight of the process is widely credited with saving Nigeria billions of dollars in fraudulent fuel subsidy payments. Mr Aig-Imoukhuede is the Chairman of Friends Africa and the first African Co-Chairman of the GBC Health. He is also the immediate past President of the Nigerian Stock Exchange. 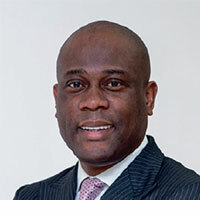 Herbert Wigwe, a Chevening Scholar, is the Group Managing Director of Access Bank Plc. He holds a degree in Accountancy, a Master’s Degree in Banking and International Finance from University College of North Wales, and a second Master’s Degree in Financial Economics from the University of London. He is a Fellow of the Institute of Chartered Accountants of Nigeria and the Chartered Institute of Bankers of Nigeria. Ofovwe Aig-Imoukhuede, a Chevening Scholar, is a lawyer and banker, with many years of experience in the field of youth development. She has an LLB from Kings College, London, an MBA from the University of Cambridge, and an MSc in Development Management from the London School of Economics. Dr Jeya Wilson, a Commonwealth Scholar, has worked in several countries and sectors in roles such as Director UNDP, New York and Executive Director, MBA University of Geneva. She serves as an independent member on committees of the board of the WHO, ILO and the Global Fund and is a university governor. She holds a doctorate from the University of Oxford, where she was President of the Oxford Union. 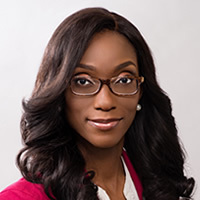 Chienye Ogwo is a lawyer and trained journalist with over sixteen years’ combined experience in organisational transformation and stakeholder management, strategic communication and legal practice. She has an LL.B from the University of Lagos, a B.L. from the Nigerian Law School and an M.S. in journalism from the Columbia University Graduate School of Journalism. 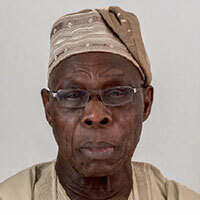 Chief Olusegun Obasanjo is a two-time President of Nigeria. He served as Nigeria’s military Head of State from 1976–79, becoming the first military ruler in Nigeria to hand over power to a democratically elected government. In 1999, he was elected civilian President and held office until 2007. Chief Obasanjo is a leading African statesman. He has developed a strong international profile as a result of holding various positions in the United Nations (UN) and other organizations such as the African Union, where he was Chairperson from 2004 to 2006. The UN has inducted him as special envoy of Africa, and as a representative of the African Union and the Economic Community of West African States (ECOWAS), where he oversees the democratic elections of countries across the African continent. Mr Olusegun Adeniyi is a journalist who has worked with The Guardian the African Concord magazine and THISDAY newspaper. 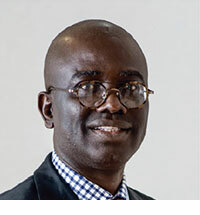 Mr Adeniyi is currently the Chairman of the THISDAY Editorial Board and writes a weekly column titled: ‘The Verdict’. Between 2007 and 2010, he served as Special Adviser on Media and Publicity to the late President Umaru Musa Yar’Adua. He then became a Fellow at the Weatherhead Centre for International Affairs at Harvard University. He is also a Senior Fellow of the Nigeria Leadership Initiative (NLI) and a founding member of the National Stakeholder Working Group of the Nigeria Extractive Industry Transparency Initiative (NEITI). He holds a BSc in International Relations from Obafemi Awolowo University, Ile-Ife, and a Masters in International Law and Diplomacy from the University of Lagos. 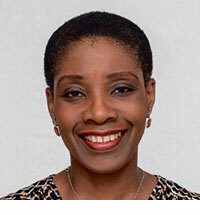 Dr Enase Okonedo is the Dean of Lagos Business School (LBS), where she has responsibility for setting strategic direction for the School, as well as overseeing all academic and administrative matters. Dr Okonedo is a Fellow of the Institute of Chartered Accountants of Nigeria (FCA), the International Academy of Management (IAM) and the Society of Corporate Governance Nigeria (SCGN). 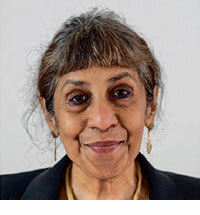 She also serves as member of the AACSB International Board of Directors, the Academic Advisory Board of the Global Business School Network (GBSN) and of the Academic Advisory Board of the Blavatnik School of Government at the University of Oxford. Dr Okonedo has a Bachelor’s degree in Accounting from the University of Benin, an MBA from IESE Business School, Barcelona and a Doctorate in Business Administration from International School of Management (ISM), Paris. Alhaji Abubakar Mahmoud is the President of the Nigerian Bar Association, a Vice President of the Nigerian Stock Exchange and the Managing Partner of the law firm, Dikko and Mahmoud. He has previously served as the Kano State Attorney General and Commissioner for Justice. 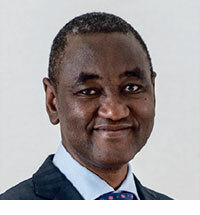 He is a Senior Advocate of Nigeria (SAN), and he serves on the World Bank Country Advisory Group for Nigeria and on the National Advisory Council of the Nigeria Stability and Reconciliation Programme (NSRP). He holds a Master’s degree in Law from Ahmadu Bello University and is a fellow of the UK Chartered Institute of Arbitrators. Mrs Yemisi Ayeni is a former finance director of the Shell Nigeria Exploration and Production Company, which earned her the distinction of being the first Nigerian woman to be appointed to the Board of a Shell company in Nigeria. She retired as Chief Executive Officer of the Shell Pension Fund in 2015. She currently serves as the Chairman of the Board of Directors of NASCON Allied Industries Plc, where she was appointed in 2015. She is also a Chartered Accountant (ACA) and a member of the Institute of Chartered Accountants in England and Wales. She has an Economics degree from the University of Manchester. 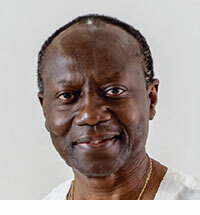 Mr Ken Ofori-Atta is the Finance Minister of Ghana. He is an Economist and Investment Banker, and co-founder of Databank in Ghana. Prior to co-founding Databank, he worked at Morgan Stanley and Salomon Brothers in New York. He was named a Global Leader of Tomorrow by the World Economic Forum. He is co-founder of the Africa Leadership Initiative of the Aspen Global Leadership Network and a Henry Crown Fellow of the Aspen Institute. Mr Ofori-Atta holds a BA in Economics from Columbia University and an MBA from the Yale School of Management. He was honored as a Donaldson Fellow at Yale University and is the first African-born recipient of the John Jay Award from Columbia University, which is presented to alumni of Columbia College in recognition of a commitment to a new generation of African leaders. 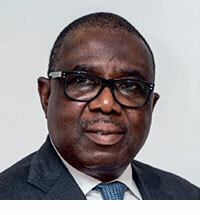 Mr Ernest Ebi currently serves as the Chairman of Fidelity Bank Plc. He served as Deputy-Governor Policy and Corporate Services of the Central Bank of Nigeria between 1999 and 2009. He commenced his banking career in the United States and went on to be appointed Managing Director/Chief Executive Officer at New Nigeria Bank before he was appointed Deputy Managing Director and Chief Operating Officer at Diamond Bank. Mr Ebi is an Independent Non-Executive Director at Dangote Cement Plc, and Chairman of AIICO Pensions Ltd. He received his undergraduate degree in Business Administration and MBA from Howard University.